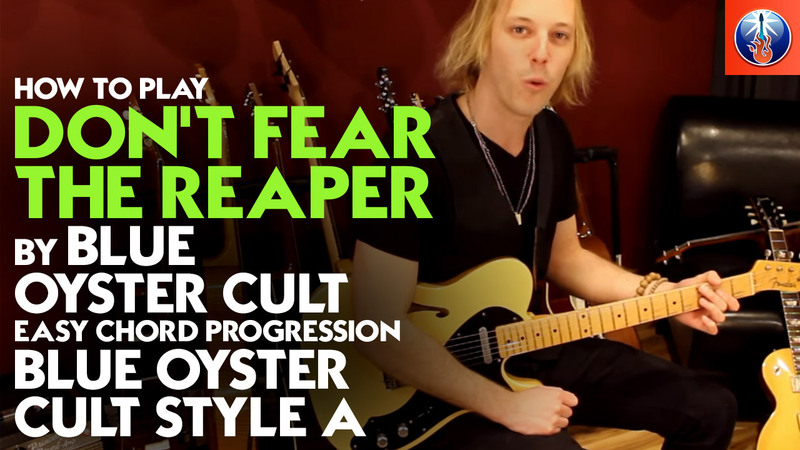 In this Guitar Control video Lesson, Instructor, John Maclennan, is going to show you how to play Don’t Fear the Reaper on guitar by Blue Oyster Cult. This is a really cool arpeggiated riff based off of just three main chords. So this is a great song for beginners and a great way to learn about arpeggiating chords, a very cool technique that sounds crazy than it is. All you are doing is holding a chord shape and instead of strumming you are picking one note at a time in a pattern to create a really cool sound. Step one to learning how to play Don’t Fear the Reaper on guitar is making sure you know the three main chords that this riff is based off of. The three main chords are an A5, a G, an F69, and a G again.An F69 means an F with a sixth and a ninth added to the triad. This is a chord extension and the 6th and 9th are referring to the degrees of the scale. We are going to start on the A5. John plays this chord by leaving the 5th string open, placing his middle finger on the 4th string 2nd fret, and his ring finger right under it on the 3rd string 2nd fret, strum only the 5th to 3rd strings. In this song though we aren’t strumming we are arpeggiating, so hold down this shape and then pick the 5th string, then the 4th, then the 3rd. Then he is also going to play the 3rd string open then John moves to a G chord that he is only going to play using two fingers, his third finger and his second finger. Place your third finger on the 6th string 3rd fret, and your second finger on the 5th string 2nd fret, your finger will be making kind of a diagonal shape. Then just pick straight down four strings in order from the 6th string to the 3rd string, while holding down this two finger G shape. So hold down the two finger G and the pick the 6th string, the 5th string, the 4th string, and then the 3rd. Watch John put these two chord together at about the 1:41 minute mark. If you are enjoying learning this arpeggiated riff make sure to check out our other lesson on how to play Dear Prudence by The Beatles for an arpeggiated and fingerpicking song. After we put both of those two chords together, now we move to the F69. To play this chord all you have to fret is basically an F5 power chord but you are including open strings, making it an F69. So to play this place your pointer finger on the 1st fret 6th string and your ring finger on the 5th string 3rd fret. Keep your fingers really arched so that you don’t accidentally mute anything because we want to let the 4th and 3rd string ring open for this chord. To play this for the song it is super simple, we just pick from the 6th string straight down to the 3rd. So hold down the F5 (but we are playing an F69 because of the open strings) and pick the 6th string, then the 5th string, then the 4th string, and then the 3rd string. Then return to the G sequence again. Play the two finger G, ring finger on the 6th string 3rd fret and middle finger on the 5th string 2nd fret picking the 6th string, the 5th, the 4th, and then the 3rd. Play all of these notes in a strictly eighth note rhythm and all downstrokes. See the video at the 2:39 minute mark to see john play through the whole riff, show you the picking direction, and count it out for you. I hope you enjoyed learning how to play Don’t Fear the Reaper on guitar. This has to be the most famous Blue Oyster Cult song of all time and what a great song to learn! Its super catching and is pretty basic. Only three chords used and a great introduction into arpeggiated chords. Remember to not only learn these songs but to use them as inspiration to spark your own creativity with your own music. Taking songs you already know and love and playing them appreciated like this one, or even better, writing your owns! And of course, as always, have fun!